My husband and I recently had a discussion concerning which places we lived or visited that impacted us the most. How do you know how if a trip has “changed your life” or at least deeply influenced your beliefs, choices or lifestyle? Morocco was at the top of my list for “most influential trip.” After visiting for a week in 2009, I not only thought I wanted to visit again, but I wanted to move there! Forever embedded in my visual memory is the scenery heading deep into the Atlas mountains from the desert terrain. The only way I know how to describe what we saw is by recalling another similarly-terrained location – Scotland. Scotland in North Africa – complete with highlands, stone walls, rolling greenery, shepherds, wool hats and mist. Unbelievable. But recalling the vistas doesn’t impact my day-to-day activities. Ah, but recalling the food does. One of the more superficial ways travel has influenced our family is in what we choose to eat at home. We’ve eaten a lot of good food. There’s a lot of good food out there to be eaten! If we eat something while abroad and long for it when we get home, I hop online and I look it up to see how I can adapt it to make it in our own kitchen. After experimenting with several Moroccan stew and meat recipes, I made my own spice mix and have settled on some meals that are now family favorites. Even our baby, with her six teeth, enjoys the food after I’ve mashed it through the manual food grinder. Another family favorite is a one-pot meal of grilled rounds of turkey sausage mixed with noodles and sauerkraut with caraway (Bavarian style). Obviously, this simple, quick dish came out of our time in Germany. Our family also frequently enjoys mild, East African curries with lentils and vegetables. This was a staple in my childhood home. Some good food I don’t try to make at home. Ingredients are hard to find or too expensive to bother. (Six dollars for a tiny tub of crème fraîche?! Seriously). Some good food I’ll only eat fresh at the source. (Rocky Mountains oysters! Yes, they were good). Some food I want to try again in its native habitat so I can experience not only the flavor, but the culture, people, and visuals that accompany it. Like Morocco. Maybe one day we’ll find ourselves living there and realize that first trip impacted us beyond the simple spice mix I took away. I love that you are so open-minded and raising your family to be the same. Everything you shared sounded so yummy (except for the Rocky mountain oysters?) … It’s all making me hungry for something exotic. Food is what makes life even more fun and exciting…! Oddly, I was the only one in my family that had a taste for international foods. Thankfully married a man who is open to trying new things. Have you tried that one East African joint in North Park? Yum! 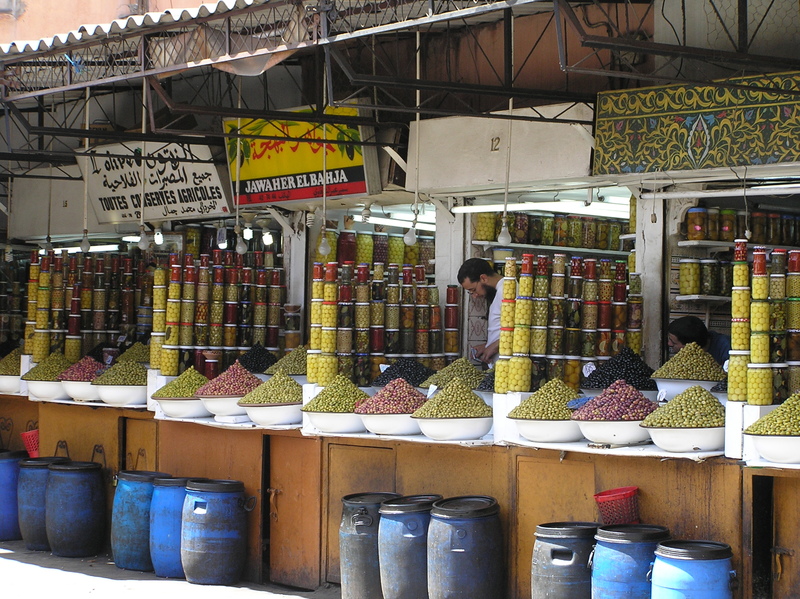 I would absolutely revel in a shopping spree at the market in your picture. Previous Post and some to share.